The $99 tablet is not yet a reality, but if you can settle for pre-owned last year gadgetry of pretty good quality, you can actually buy a 7-inch tablet right now for even less. The 2011 16GB BlackBerry PlayBook, a 7-inch tablet running on the awesome gesture-based BlackBerry Tablet OS, is going for $89.99 in a one-day blowout sale. The PlayBook charges via microUSB and you can easily hook it up to an HD TV via its micro HDMI port. On the downside, it’s a bit on the heavy side at 14 plus ounces and has little apps. But the user interface is awesome, and that price... Hit the source below to get it - the deal only lasts today. What ??!! Show me better tablet for 90$ !! It isn't worth $90 even if there is a better tablet. These are getting handed out for free to developers. The playbook will be less than $50 soon. BB said in Mid 2012 that they were going to upgrade this to BB 10. Hoping so, . $90 sounds pretty good to me...this thing is selling on ebay in the 130 range. It may not support all the apps that are on iOS or Android but how many apps do you really need??? i used about 20-30 apps tops. 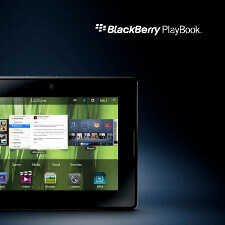 Playbook was a solid offering from Blackberry I thought. I wouldn't even pay a quarter of the price for it. But you'll pay 5 times the price for a novelty that does half as much. Genius. The Playbook is an exceptional tablet. I have yet to hold another tablet that equals the overall build quality of it. Anyone who says otherwise has obviously never used one before. For $90, you are in no way getting ripped off. Agreed. Build quality is very good and the form factor is nice. As far as it being "heavy" at 14 oz, what? 14 oz isnt heavy at all. With the amount of apps bb is packing im going to pass. Can't android apps be side loaded on it?